Ugandan politician and musician Bobi Wine has led opposition to Uganda's president, who has been in power since 1986. Wine says soldiers tortured him, but he will return to Uganda. "I'm supposed to be a dead man," says Bobi Wine, a Ugandan musician turned politician. His driver Yasin Kawuma was shot dead on Aug. 13. Wine tweeted a graphic picture he said was of the man's dead body. Wine says police were the ones who shot Kawuma, but Wine says he was their real target. Bobi Wine's real name is Robert Kyagulanyi Ssentamu. He rose to fame as a musician — first with love songs and dance songs, but more recently turned to political themes in his music. His 2017 song "Freedom" has become a rallying cry for the country's opposition. In the same year, Wine was elected to the country's Parliament as an independent. He's become a leader in opposing the country's longtime President Yoweri Museveni — in power since 1986. Museveni is known for violently crushing dissent. Human Rights Watch says the government "continues to violate free association, expression, and assembly rights." "We are living in a country where life does not mean a thing," Wine tells NPR's Scott Simon. Wine came into NPR's offices in Washington, D.C. this week. He was walking with a crutch. "I'm feeling pain in my back, in my shoulders, in various parts of my body. But my spirit is high and I don't think about pain anymore," he says. He was arrested in mid-August after clashes between opposition supporters and supporters of Uganda's ruling party. Security forces accused Wine of fomenting the violence and arrested him. Wine was later released and promptly rearrested and charged with treason, along with 33 others, according to Amnesty International. Wine says security forces beat him severely and tortured him. He wrote on Facebook that soldiers broke down the door of a hotel room where he had holed up and beat him with an iron bar, then dragged him into a vehicle and continued to beat him. Wine tells NPR it was the soldiers of the Special Forces Command, a group that guards the president, who "kicked me, beat me everywhere and did despicable things to me. They squeezed my testicles, they hit me with gun butts, when I screamed they rapped my head again and hit me so hard on the back of the head until I was unconscious." Uganda's security minister, Gen. Elly Tumwine, told The Washington Post that Wine and others "fought with the ones who arrested them, and that's what caused their ailments," adding that a "medical examination found there wasn't much." Government spokesperson Ofwono Opondo P'Odel said in a statement that Wine "is before courts of law in Uganda for treason and inciting violence, and no doubt, his lawyer[s] Bob Amsterdam and others are trying to get him off the hook by employing diversionary tactics in raising the tantalizing, although unproven, allegations of torture." President Museveni has called Wine's allegations of torture "fake news." Wine was eventually allowed to leave the country. He came to the U.S. for medical treatment, and held a news conference this week to encourage halting U.S. military aid to Uganda. He talked more about U.S. aid to Uganda and his plans to return to the country, despite the risks, with Simon on Weekend Edition. All of us want a peaceful region, and indeed the Ugandan army plays a role and the U.S. government plays a role funding the army. But it's important also for the U.S. to know, especially the U.S. taxpayer, that the money they give the Ugandan military is mainly used to torture Ugandans. I would note that the gun that was used to shoot my driver is an American gun. It's dangerous for me, but this is not just about me. There is this lady who just had a baby by C-section. She was beaten so hard that even by the time I left Uganda, she was still passing blood. There's another guy ... the doctors told us he will never be able to walk. There's another lady, I'm not sure if she's still alive. I'm supposed to be a dead man. It was just a few seconds when I left that seat where I was sitting that my driver was shot. We are living in a country where life does not mean a thing. My children live in Uganda. They are Ugandans. And even when I could get them asylum, there are more than 40 million Ugandans. Eighty-five percent of them are younger than me. I am 36 years old. And we have a demographic of over 85 percent under the age of 35. So it cannot be about my life. I've said this before and I'll say it again: We have to win back our freedom and dignity or we shall die trying. Everybody's advising me not to go back. Everybody thinks it's dangerous to go back. But as one person I cannot leave 40 million people in danger. If my life is a sacrifice that has to be taken for the redemption of our country, so be it. NPR's Adelina Lancianese contributed to this report. Bobi Wine says the people who tortured him in an ambulance last month unscrewed an overhead light bulb to hide the beatings from the press. Bobi Wine is a politician and a pop star in Uganda, where he's been an outspoken critic of the regime in power there. After a contentious election to replace a parliamentarian, some protests turned violent. Bobi Wine's driver was killed. 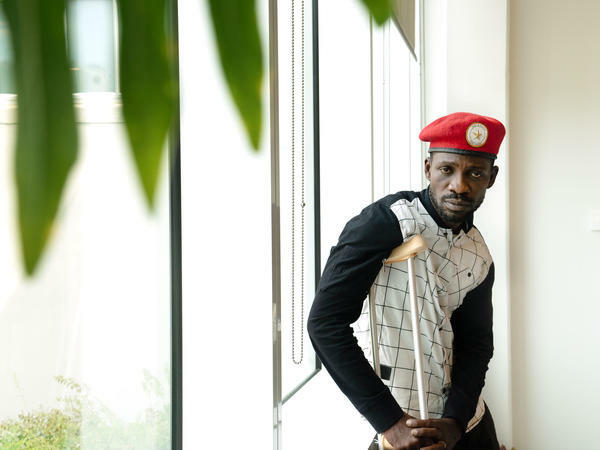 Bobi Wine says he was tortured by government forces. He was eventually charged with treason. Bobi Wine joins us in our studios. He's been permitted to come to the United States for medical treatment. Thanks so much for being with us. BOBI WINE: Thank you very much for having me, Scott. SIMON: You came here on a crutch. How are you feeling? WINE: I'm alive. That's the best answer. I'm feeling pain in my back and my shoulders and various parts of my body. But my spirit is high. And I don't think about pain anymore. SIMON: This will be painful, I'm sure, to get you to recount. But what happened? How were you beaten and tortured? WINE: So after the campaigns, I retreated - I returned to my hotel room. There, we were attacked. The military - the section of that military is called Special Forces Command, which is the section of the military that guards the president. And it's led by the president's son. And before I knew it, they all descended on me, kicked me, beat me everywhere and did despicable things to me. They squeezed my testicles. They hit me with gun butts. When I screamed, they rapped my head again and hit me so hard in the back of the head until I was unconscious. SIMON: Your attorney Robert Amsterdam said this week that you would urge the U.S. government to halt military funding to Uganda. Now, as you know, the U.S. supports the Ugandan army, so they can be deployed for international peacekeeping missions. Respecting what you've been through, doesn't the U.S. have powerful strategic reasons to support the Ugandan military? WINE: All of us want a peaceful region. And indeed, the Ugandan army plays a role. And the U.S. government plays a role funding them. But it's important also for the U.S. to know, especially the U.S. taxpayer, that the money they give the Ugandan military is mainly used to torture Ugandans. I would note that the gun that was used to shoot my driver is an American gun. SIMON: You're going to go back to Uganda? WINE: Yes. I'm going to go back to Uganda. I don't have another home. Uganda is my home. That is where I was born. And that is where I will be buried. SIMON: It's dangerous for you. WINE: It's dangerous for me. But this is not just about me. There is this lady who had just had a baby by a C-section. She was beaten so hard that she - even by the time I left Uganda, she was still passing blood, you know? There's another guy called Atiku (ph). The doctors told us he will never be able to walk. There's another lady - I'm not sure if she's still alive. So many people - hundreds, if not thousands - go through this torture. So this cannot be about me. I'm only humbled and privileged to see that my brutalization attracted the eye of the world. And I'm trying to use every little time that I still have alive to raise that voice. SIMON: Did you say every little time you still have alive? WINE: Yes, every little time I still have alive. SIMON: ...Something violent to happen to you. WINE: Yes. I'm supposed to be a dead man. It was just a few seconds when I left that seat where I was sitting that my driver was shot. We are living in a country where life does not mean a thing. I'm not sure whether this is not the last time I'm coming here or to any other country. So I've decided to dedicate every last bit of my life to raise that voice. SIMON: You could stay here and still do a lot of good for Uganda, couldn't you? You could play your music. You could draw the attention of the world to the plight of Uganda and live a life. WINE: Yeah. I would live a life. But it would be a half-life. My children live in Uganda. They're Ugandans. And even when I could get them asylum, there are more than 14 million Ugandans. Eighty-five percent of them are younger than me. I am 36 years old. And we have a demographic of over 85 percent under the age of 35. So it cannot be about my life. I've said this before. And I'll say it again. We have to win back our freedom and dignity. Or we shall die trying. SIMON: I want to hear some of your music, if that's OK with you. WINE: That's all right, please. SIMON: Your song "Freedom" - it was released last year. Let's take a listen. WINE: (Singing in foreign language). UNIDENTIFIED SINGERS: (Singing) We are fighting for freedom. WINE: (Singing) ...Fighting for freedom. Man - makes me sad. SIMON: What's your political goal now? Can you wait for another election? Or do you think Uganda has to change before that? WINE: For now, we're sensitizing people to get confidence even in the arms - in the times of terror. We don't know what's going to happen tomorrow. Many of our contemporaries are being killed every now and then. So in Uganda, we leave every day the way it comes. SIMON: Can you tell us what your doctors say? WINE: I've not gotten my results yet. SIMON: How do they feel about you going back? WINE: Well, everybody's advising me not to go back. Everybody thinks it's dangerous to go back. But as one person, I cannot leave 14 million people in danger. If my life is a sacrifice that has to be taken for the redemption of our country, so be it. SIMON: Bobi Wine, member of Parliament in Uganda, where he faces charges of treason. Thanks so much for being in our studio. WINE: You're much welcome. Thank you for having me. And God bless you. SOUNDBITE OF BOBI WINE SONG, "FREEDOM" Transcript provided by NPR, Copyright NPR.